Making the learning process enjoyable and stimulating 🙂 !!! What Service is Provided to Students? Where does tuition take place, when and at what cost? Tuition is provided either at the home of the client or at a public library in a private room. Documents, directions, assistance and feedback are provided during the week to the student through e-mail. The individual sessions run for 60-90 minutes each at a cost of $100 per hour, and can occur at times to suit the student after school hours or on the weekend. A great deal of work is completed between sessions both for the students by me and by the students themselves. Time in the sessions is relatively short, but I aim to be generous, flexible and forthright. If a student chooses to cancel an appointment without 48 hours prior written notice the full fee may be charged. The most immediate difference between GBD Education and other forms of study is that the sessions are an opportunity for students to discuss their thoughts, their ideas and their efforts in great depth with a professional consultant. In exploring accelerated studies through discussion, students are able to express the process and purpose they have pursued in completing tasks. Students learn: to examine their efforts and achievements; to identify their skills, their strengths, their weaknesses; to be confident and determined; and to pursue stronger methods and advanced results. Mentorship is thus not a program of extra lessons and exercises, but a vehicle for active listening in order to engage students to develop high-order thinking skills and abilities. My qualifications include a Bachelor of Arts and Graduate Diploma in Education from the University of Melbourne, a Certificate of Gifted Education from the University of New South Wales and the Gifted Education Research Resource and Information Centre, and a Masters of Education from the University of Melbourne. 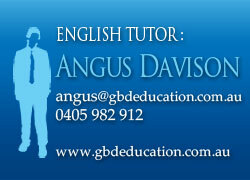 I have nearly 8 years experience in mentoring and tutoring gifted and talented students and VCE students, and over 10 years teaching experience in English and Humanities subjects. What should you do next if you seek my services? 1. 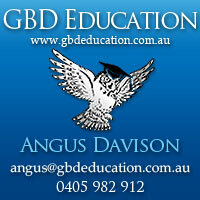 Write to me at angus@gbdeducation.com.au. Aim to organise a preliminary consultation at your home in which individual student abilities, aims and opportunities will be assessed. 2. Read my subsequent preliminary report and organise a follow-up meeting. 3. Ask if you have any queries to resolve, and communicate your position with me. How does one view Harry Potter?